Adjust oven rack to middle position and preheat to 350° F. In the bowl of a food processor, process cookies into fine crumbs. Drizzle in the butter and pulse to combine well. Using a sheet of plastic wrap, press crumbs evenly into the bottom and sides of a 9-inch pie plate and refrigerate until firm, about 20 minutes. Place the pie plate on a baking sheet and bake until set, 8-10 minutes. Cool completely on a wire rack. In a medium bowl, beat egg yolks; set aside. In a medium saucepan combine the gelatin, sugar, 1/2 cup cream, and salt and let sit until the gelatin softens, about 5 minutes. Place the pan over medium heat and cook until the gelatin dissolves and the mixture is very hot but not boiling, about 2 minutes. Whisking vigorously, slowly add the gelatin mixture to the egg yolks. Return the mixture to the saucepan and cook, stirring frequently until slightly thickened, about 2 minutes. Remove from the heat and add the creme de menthe and chocolate liqueur. Pour the mixture into a clean bowl and refrigerate, stirring occasionally until wobbly but not set, about 20 minutes. In a large chilled bowl using a wire whisk or hand-held mixer, beat the remaining cream to stiff peaks. Whisk 1 cup of the whipped cream into the gelatin mixture until completely incorporated. Using a rubber spatula, fold the gelatin mixture into the remaining whipped cream until no streaks remain. Fold in food coloring (if using) to desired color. Scrape the mixture into the cooled pie shell, smoothing the top, and refrigerate until firm, at least 6 hours or preferably overnight. (The pie will keep wrapped in plastic wrap in the refrigerator for up to 3 days.) Garnish with whipped cream and chocolate curls, if desired. Enjoy! I love grasshopper pie!! This sounds awesome! And a good strategy it is ☺. Happy 14th to Jack! And he definitely chose an awesome pie! Was looking for a Grasshopper pie without marshmallow filling. This looks divine. Making for Christmas Eve! I was hoping to make this for St. Patrick's Day, but I see the alcohol doesn't get cooked off? Fine for me, not so great for my kids....Maybe I'll bring this to my next girls night out. 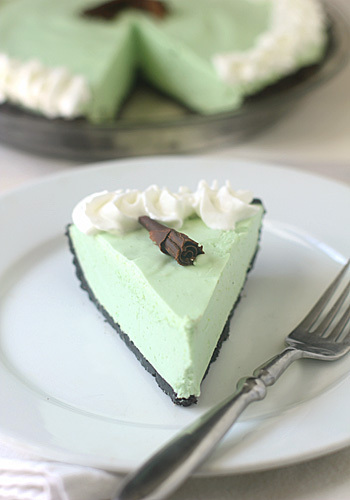 I also want a grasshopper pie that does not taste like marshmallow. Why is there chocolate liqueur in the filling? Does it give the filling a chocolate taste? Could I leave it out? Yes it does and I do not recommend omitting it from the recipe. The heat from the custard mixture will cook out the alcohol.